Welcome to Dantes Partners. We are excited that you’ve taken the time to learn about us and our work; we’re honored to play a major role in meeting a growing, fundamental need in our communities — quality, affordable housing. At its core, Dantes Partners was founded because in my youth, the spectre of homelessness always loomed; it became real after I graduated college, secured a good paying job but took what seemed like forever to find decent, livable housing to call home in New York City. I eventually found a place that I could afford but it was an hour and a half commute from my job. I experienced the same housing situation when I later moved to San Francisco and then to Washington DC. As an ardent problem solver, I decided in late 2005 to address the issue of housing because I knew that my situation was not unique; there were many people who also wanted to live close to where they work. I made it my mission to connect housing choices to transportation options while providing owners and renters with all of the amenities that come with a vibrant urban city. Over the last 13 years we’ve been singularly focused on creating housing for people of modest means in the heart of the Nation’s Capital. We’ve produced housing for our valued residents – our elders, workforce and our long-term residents. At the same time, we’ve built a company with a crew of dedicated people and partners who share the same values. It is our hope that you regard our passion as an invitation to work with us to stem the market rate housing tide that threatens affordability in DC and in similar cities. Enjoy your time visiting our site and feel free to leave a comment or contact us directly should you find that we can be of assistance to you. 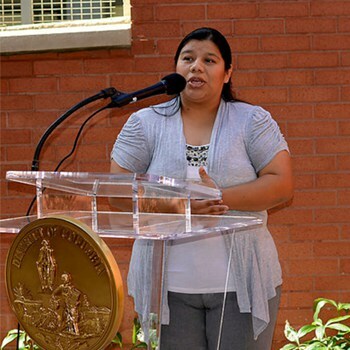 Rocio is an office manager at Mundo Verde Public Charter School and a working mother of 2. Her commute to work and school took nearly 2 hours, but when she moved into Justice Park, her commute time reduced to less than 20 minutes. She is able to spend more time with her family and lives in a thriving community that provides easy access to all of the services and amenities she and her family requires. She was also able to realize enough cost savings during her time living at Justice Park that she recently purchased her own home. Resident #2 lived in Upper Marlboro and commuted nearly 2 hours each way to work at the Washington Hospital Center in Northeast. When she moved into Justice Park, her commute time was reduced to 15 minutes, and she is now able to spend her free time enjoying all of the restaurants and social activities offered along 14th Street and the U Street corridor.